Summary: Set in Christchurch twelve months after the devastating earthquake that flattened a lot of the city, Sunday sees the very Aussie Charlie (Dustin Clare) arriving to visit his ex-girlfriend Eve (Camille Keenan). The catch here is that their once flourishing relationship is now in tatters but Eve is pregnant with Charlie’s baby. As Charlie awkwardly tries to be there for Eve he is soon shocked to learn that she has moved on with Stephan (Jacob Tomuri). Soon he is left wondering whether he can simply just be friends with Eve and just be a Dad to her child or whether like the city around them this is something that can be re-built. The danger with doing a largely dialogue driven film is that in the hands of the wrong filmmaker they can become a dangerously slow affair that could potentially put an audience into a deep coma. Luckily for all involved with Sunday the small team behind this independently produced New Zealand film is that they were right on the money and have created a wonderfully written relationship drama that should be the envy of any Hollywood screenwriter. Director Michelle Joy Lloyd announces herself as one of Australia’s brightest young directional talents as she takes the script written by herself and real life and on-screen couple Camille Keenan and Dustin Clare and turns it into a thought provoking relationship drama that well and truly draws its audience in. Delivering all the angst and strong writing of an episode of The Secret Life Of Us Sunday allows it’s audience to sit back and be taken on an emotional journey that is aided by the fact that both Charlie and Eve likable characters. It is easy to see that this is the kind of film where a male audience will be able to easy identify with Charlie and a female audience put themselves in the shoes of Eve. At times Sunday does become very dialogue driven but luckily the screenplay is so well written that the film never feels like it is being bogged down by being too wordy. And somehow the film manages to conjure about great suspense and tension through strong scenes between Charlie and Eve that any couple can relate to. Somehow the screenplay also manages to remain realistic throughout and thankfully never becomes some flowery romance that makes you want to gag. The script’s ability to tie in the story of a relationship rebuild with how Christchurch is rebuilding and not giving up around them is also a stroke of screenplay mastery. 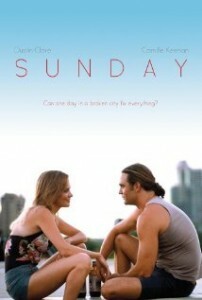 Making Sunday even stronger are the genuine performances from both Dustin Clare and Camille Keenan. The real life couple bring a strong chemistry to their performances and credit must be paid to Keenan who actually filmed this one pregnant. The limited time period that they had to shoot the film does not show in their performances and instead we get two good performances that show that both these actors deserve much meatier roles in the future. Hopefully Sunday will be enough to elevate them off the small screen and onto the big screen. Sunday is the kind of film that is best enjoyed by somebody that likes intelligent cinema and doesn’t need a load of explosions or CGI to keep them happy in the cinema. It is well thought out, well acted and a film that deserves to go a long, long way. Other Subculture Entertainment Sunday reviews: You can also find our Sunday review on The Book The Film The T-Shirt. You will also be able to hear our Sunday review on an upcoming episode of The Good The Bad The Ugly Film Show.